This Galway Irish Crystal waisted vase is part of the master collection. The Master Collection is Suitable for Engraving at the Factory in IRELAND for $60.00 Per Item. The 14" tall waisted vase is from the Galway Crystal Master Collection and is a special order item that requires 4 - 5 weeks delivery time. 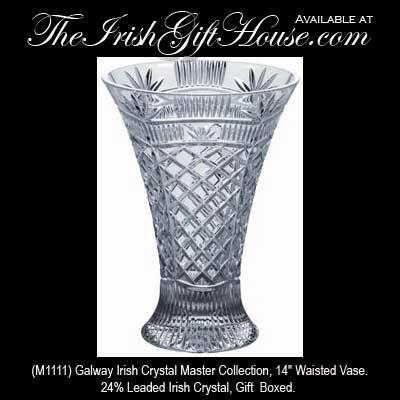 The Irish vase is 24% leaded crystal and is gift boxed. This Galway Crystal vase is suitable for engraving at the factory in Ireland.